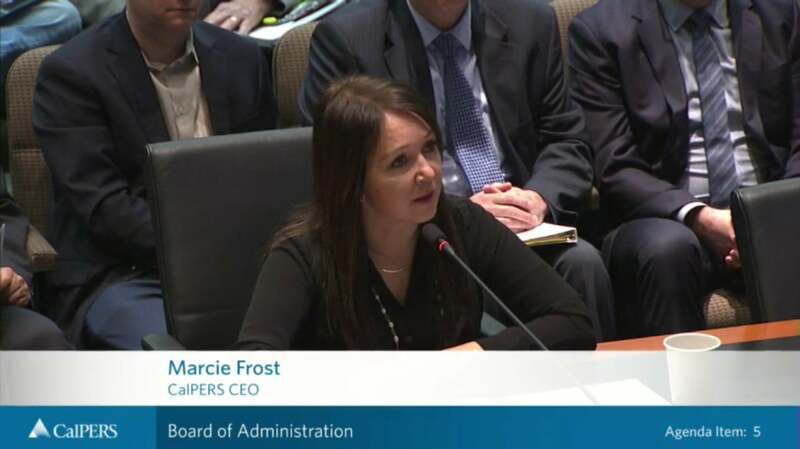 CalPERS CEO Marcie Frost discusses CalPERS benefit education event at the meeting of the Board of Administration on March 19, 2019. Thank you. Good morning. Members of the board. Thank you. President Jones I wanted to start a little bit with investments and as you know our investment return assumption is probably the most critical assumption we use in calculating our future liabilities. And so each asset class does play a vital role in being able to hit our return target. One of the items that we talked about yesterday was the board's self-evaluation and the need for onboarding and continued education. And so what you will see in the investment committee over the next year is we will be bringing forward workshops around the various roles of the asset classes and we'll have each of our managing investment directors over those asset classes come and talk to the board about strategy for that class and essentially how does that class make money for the fund and for the members. So watch for that over the next year next year or next month we actually will have been do a workshop and that workshop will be more related to pillar 2 around co investments. So this is the plan that he and the team said they would bring back to the board and to the committee and we'll start doing that in April but has been has also emphasized every tool is necessary in order to hit our 7 percent return target. So the team and I also want to thank the board for the decision that was made on Monday to be able to allow us to move forward with the concept and see if we can actually execute on that concept in the market. I have absolute confidence in Ben and I know you do as well and trust his professional judgment in what I've been saying to people is if anyone can execute on the new concept in innovation it's been making our new CIO also in Monday's investment committee you received an annual update from our sustainable investments team. They did outline their process and progress with the initiatives in the five year plan and also highlighted the results of our core engagement work. I can't really emphasize enough the importance of valuable data but the initiatives are using to develop our strategy and the more that we can actually find the data to measure the impact of our work around environment social and governance issues. We know that by minimizing risk we can actually have a better chance of improving our returns. Turning now to some outreach and engagement earlier this month we did hold another CalPERS benefit education event. This one was held here in Sacramento. I know several of you were able to attend that event. As I been able to do some of the other what we call CBs, the CalPERS benefit education event. I was able to talk with several members about the work that we are doing here at Cowper's to further strengthen the fund and to make the system more sustainable. The number one question remains the same as my benefit safe. And are we paying attention to making sure that we're making the right decisions to ensure the safety of that benefit ongoing. I always appreciate the opportunity to interact with our members being able to address their questions and hopefully be able to give them make them feel a little less anxiety about the future. So our next CB event will take place just a couple of days from now on Friday and Saturday in Eureka. I've also started meeting with several of California's business leaders and groups in the last month to enhance their understanding of the work that we're doing at CalPERS and how we could potentially build partnerships over the long term. One of those meetings was with the Silicon Valley Leadership Group and we discussed the fiscal health of the system and the importance of investing in areas like biotech life sciences and healthcare. I also met with two other groups of business leaders from the California Business Roundtable which is comprised of leaders from major corporations in the state and the California Manufacturers and Technology Association. And then last week Ben and I had a chance to travel to meet with Dan Borenstein of the east of the Bay Area Newsgroup who has written extensively about CalPERS and in particular the liabilities around CalPERS. He did express an interest in learning more about the asset side and Ben and I both talked spoke with him about the work that would be happening here and investment committee over the next year and so looking forward to continuing to build that relationship coming up in a couple of weeks on April 2nd and 3rd I'll be speaking at a panel for the Fortune magazine brainstorm Health Conference this annual event draws business leaders together from technology, health, business sectors to look at some of the major challenges facing healthcare in our country and to discuss ideas and innovation to solve them. I do plan to address the work that we've been doing here at CalPERS to enhance our ability to compete in the healthcare marketplace and how we've developed innovative proactive practices like reference price seeing value based insurance design.